Differentiated instruction allows teachers to tailor study to a student's needs and/or interests. Nothing is more frustrating than having to watch a student who has easily mastered the material not be challenged as he/she waits for others to grasp the material or to watch a student struggle so intensely with a concept that he/she continues to fall behind. Canvas makes approaching differentiated instruction easy, and that is always good news for teachers who often feel pulled in multiple directions in any given class period. Reach both the soaring and struggling student at the same time! Below are several strategies to leverage differentiated instruction in your classroom through Canvas! 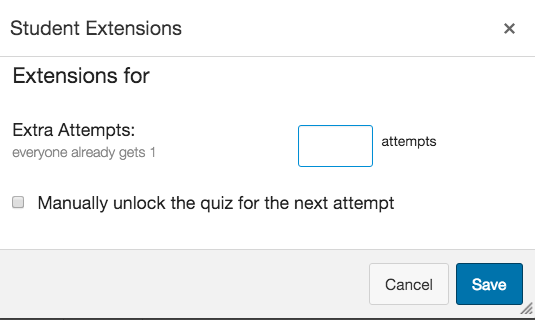 One of the key features of Canvas is the ability to assign one assignment to individual students. Assume a student in your classroom has mastered the material well before the majority of other students. Having WebQuests or supplemental reading/assignments that meet more rigorous standards for the given standard set is a great way to help these students dig deeper into the material without having to assign to the entire class. Likewise, a student who is struggling with material might be given some supplemental or alternative assignments that further break down concepts, provide alternative methods of demonstration of knowledge, or allow students to have additional practice. Instructors can exempt students from assignments in the gradebook by entering "EX" in the gradebook cell. This would be helpful if the instructor has created a different assignment for the student that the rest of the class is not working on, or if the student is so far behind due to extended illness that some work is being excused. While the assignment still shows up in the student's "to do" list, when she tries to submit the assignment it will show it has been excused. This feature is being addressed for quizzes and discussions. Often with IEPs, students struggling with concepts, or those that have simply been absent, providing an extra day or two to complete assignments is necessary. Canvas allows instructors to assign individual students different due dates and access dates on an assignment, discussion, or quiz. This is also a helpful feature if one period of a class has fallen behind due to lost instruction time (think snow day, intruder drills, pep assemblies). 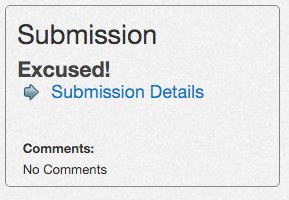 This feature is available for assignments, discussions, and quizzes. 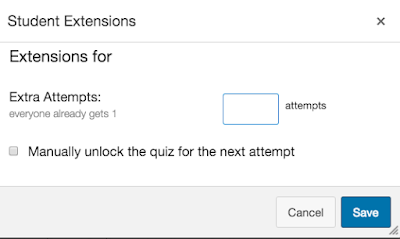 It is easy to assist struggling students in quizzes by offering extra attempts using the Moderate this Quiz feature. Choose "Moderate this Quiz" from the right side of the quiz section. Click the edit pencil to the right of the student's name to add attempts. This is another great feature for IEP students who might need to complete the quiz with the assistance of a SPED instructor at another time. Jim Knight (2012) in his book High Impact Instruction suggests that for authentic learning to take place, students need to see the work "as relevant, interesting, and meaningful." One of the features in Canvas allows students to choose from two assignments in order to complete a module/unit. This allows students to choose a task that best meets their learning styles and interests. To do this, set up module completion requirements. Students can choose from the same type of task (two discussions, for example) or different tasks (a quiz vs. a paper or presentation). The student will see he has an option when he is working in that module. Likewise it is always a good idea to give students choice within an assignment. Instructors can give students a choice to submit a video, a paper, an audio file, or link to external work on the web to demonstrate their understanding of a concept within one assignment. Simply check the allowed methods of submission when creating the assignment. Here are some innovative ways our teachers are using Canvas for intervention. Check them out and see if you can utilize their ideas! According to Glen Whitman in the Edutopia article, "Assessment, Choice, and the Learning Brain" students striving for mastery goals as opposed to performance based goals (grades) had greater growth mindset and grit. The new Mastery Paths feature in Canvas, allows teachers to create a formative assignment that will automatically send students to differentiated paths based on the score they received on the initial assignment. By anticipating the needs of learners and preparing meaningful work to supplement or extend learning for major concepts, the instructor alleviates the need to use class time creating on-the-fly assignments. It is easy to call a specific group back for a mini-lesson because it is already assigned, and other students have their own work to do. Mastery Paths allows the instructor to offer feedback quicker than before. Embedded within each mastery path is the ability to give students choice in the types of assignments they complete. If a student does better processing orally, they might choose to turn in a verbal summary of a the importance of an event instead of writing it out. Research suggests that giving students choices increases their engagement and performance on tasks. Additionally, Mastery Paths can be "hacked" to send students down intentional activities based on choice. Kona Jones has detailed this approach in a helpful blog post Hacking Mastery Paths. This is a fabulous option for reading assignments, research based and project based learning, and other inquiry projects. Differentiated instruction is nothing new, but it can be hard to implement effectively. With solid instructional design that includes clear goals, modeling, ample formative assessment, and plans for reteaching, intervention, and enrichment (whew! ), we can help all students be successful learners. Canvas makes it easier for teachers to do what they do so well--positively impact the lives of students! Amber, Wow, what a wonderful resource you've put together! It's great how you went through and illustrated the different Canvas features/tools that can be used for differentiated learning! I'm definitely bookmarking this one for further use/referring! Brilliant list Amber Hainline I will be sharing this beauty when my team of teachers sign up! Thanks! I'm glad it is helpful! Amber Hainline thank you so much for providing it this wonderful resource! Amber Hainline, I'll be linking this article to our teacher resources. Thank you for putting it together. I've shared this resources so many times, and am using it now to develop a training workshop. Thank you!